A beautiful garden is a place that you can enjoy with family and spend time with friends while leaving the stress of the work week behind. Before you can enjoy your garden though you have to cultivate it and that requires the right tools for the job. Not to worry, all of the gardening tools you’ll need are readily available and easily available. Here are the top 20 most essential gardening tools you should have. If you want to tackle weeds, but you don’t want to pollute your garden with harmful chemicals the best solution is a simple weeder. These are small hand tools with a forked end that’s ideal for digging at individual weeds and removing them by the root. If used correctly you can remove all of the offending plant so that it doesn’t come back to haunt you later. You better be ready for some hard work though – it’s a time consuming process removing weeds this way individually one at a time. On the bright side you’ll get to spend some quality time outdoors while you’re doing it. Scissors are an essential, but often overlooked tool for any real gardener. The reason is simple – they’re a highly versatile piece of equipment that can be used to do a lot of simple chores. You can use them for opening seed packets, for delicate pruning jobs of small flowers, and you can even use them for digging in a pinch if nothing else is available. A gardener has to be ready to improvise when the right tools not at hand – with a little imagination you can accomplish anything in the garden with very few tools. A soil knife is another versatile tool, but surprisingly not one that the average gardener has in his/her tool box. These tools are of Japanese origin and are sometimes referred to as a Hori-Hori. They’re ideal for all kinds of jobs that involve digging and cutting. The serrated blade is usually sharp on both ends and at the point though so it’s probably a good idea to keep it out of reach of small children. If this is the first time you’ve ever heard of one of these then you may want to head out to the local hardware store and pick one up – you’ll be glad that you did. When my wife and I bought our first home one of the first tools we bought was a small hand soil shovel. Our garden needed a lot of work as the previous owners didn’t exactly have a green thumb. You can use a hand shovel for digging out areas for plants and flowers as well as refilling the holes when you’re finished. They’re also ideal for digging out any weeds that have encroached on your garden plots. I’ve even used one for a little edging work from time to time – there may be more specialized tools for this, but they’ll do in a pinch. We have a beautiful Chinese Cherry tree in our front yard, but every spring it’s an unholy mess to behold. After a winter of very little attention from us branches have a habit of sprouting out in all kinds of odd directions. That’s why I always make sure to have a good pair of pruning shears stored in the garage ready to go to work. They have to be sharp though if you’re going to use them on small trees like we do. It’s a good idea to sharpen them at the beginning of every spring so that you’re not frustrated by trying to prune with a dull pair of shears. It’s a great feeling standing back and looking at the finished article once you’ve finished your garden, but that doesn’t mean you’re done for the rest of the year. Keeping a garden looking nice and just the way you want it requires regular maintenance. Other than sunshine what’s the one thing that flowers and plants simply have to have? Why water of course and that’s why it’s important to have a good quality hose for your garden and if you’re really serious you may want to consider a sprinkler system. 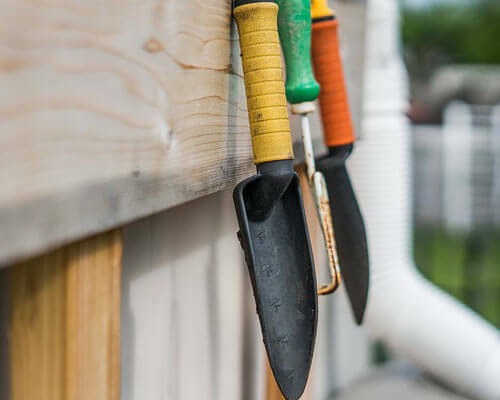 A full length curved blade shovel is a staple of most garden sheds and for good reason – if you want a beautiful garden it’s a must have. You can use a full length curved shovel for a lot of heavy duty digging jobs including planting trees and large shrubs. They’re also great for working over a lot of soil in a short period of time. In the early spring I typically use my shovel to loosen up the soil to get it ready for planting before applying the garden rake to give my gardens an overall refined appearance. A round shovel isn’t the only shovel you should have in your garden shed though. They do have their limitations. Specifically, they’re not very good for edging work. If you’re trying to move a section of grass to make a new garden plot using a curved shovel will only get you so far. Once you’ve dug out your plot it’s time to smooth out the edges and for that you need a full length flat shovel. With a flat straight edge you can finish plotting out the perfect garden section and make your yard look exactly how you’d envisioned it. Anyone that spends a lot of time in the garden likes to rake all the leaves up in the fall and then again in the spring – along with any other debris that’s built up over the winter months. The best tool for this job is a leaf rake with a large fan like blade. The bristles are typically made from a soft flexible metal or plastic material that allows you to lightly rake the whole surface of all the debris, but still leaves the soil in place. It’s one of the first garden tools I ever used as a kid when it was my job to rake the leaves – I had to earn my allowance somehow! Leaf rakes are invaluable, but they’re horribly frustrating if you’re trying to use them as a finishing tool to turn over your soil. For that you need something a little more rigid and that’s where a garden rake comes in. If you’re not familiar with these they have a solid flat blade that’s set at an angle at the end of a long pole with several solid forks sticking out from the edge of the blade. Their rigid nature makes it much easier to turn over soil and gives the soil in your garden a nice fresh healthy look. You would normally associate a saw with cutting wood for various woodworking projects, but a hand saw is also a tool that every gardener should have as well. Pruning shears might be great for plants and small branches on trees, but larger branches require something with a little more cutting power. A small hand saw is perfect for this. Sure you could go with a small chainsaw if you like, but they can be expensive and they’re really not necessary for 99 percent of all gardening jobs. In medieval Europe working with the earth was backbreaking work because they didn’t have the benefit of our modern know how. One thing they did have to make their lives easier though was a primitive version of a garden hoe. 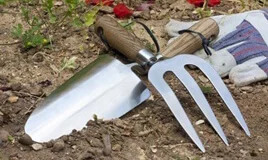 This simple innovation made the job of planting seeds a whole lot easier and while our modern garden hoe’s may be made from modern materials and designed to last a long time they are essentially the same tool. They allow you to quickly dig a shallow trench in the soil that’s ideal for planting seeds just below the surface. If you’re planning on having a vegetable garden you simply have to have a garden hoe. Some people love the feel of the dirt in their hands – it just kind of makes you feel alive. I’m one of those people and if you are too you might be thinking what the heck do I need gardening gloves for? Even those of us that don’t mind getting our hands dirty still need a good pair of gardening gloves. Digging in the dirt with a hand shovel may not seem like the hardest chore, but after a few hours of it your hands will start to feel it. If you want to avoid unwanted blisters a pair of gardening gloves is something you should seriously consider. When you’re digging out new gardens or taking care of a weed infestation you’re bound to have a lot of waste material. All of that has to go somewhere and even if you have a backyard compost heap you still have to get it there somehow. Unless your idea of fun is carrying each individual shovel full of debris over to the compost heap then a wheel barrow should be in that garden shed of yours. You can save a lot of time and effort with a good quality wheel barrow – just make sure those wheels are properly inflated before you get to work! Before I talk about the next item on our list it’s probably important that I clarify what we believe a tool is. In our humble opinion a tool is anything that makes your life a little easier and makes it possible to perform a task with less effort than would otherwise be necessary. That’s why a small stool makes our list of essential gardening tool. If you really love gardening and plan on spending several hours a week working on your yard you’ll be glad that you invested in a small garden stool. They save you from a lot of joint pain and they’re definitely a lot easier on your knees. If a stool’s just not your thing, but you still want to save your knees then you may want to consider a good pair of knee pads. Kneeling down to dig in the garden will wear on your body over time. If you just can’t stand the pain in your knees any longer it’s definitely time for a pair of knee pads. There are a couple of different ways to get rid of the leaves in your yard and it really comes down to personal preference. I’ve always used a rake and I’m perfectly happy with my choice. Some people think this is just a little bit too time consuming though and my father definitely falls into this category. He believes the leaf blower is the best invention since the toaster and there are a lot of people that share his opinion. In any case it’s definitely a good tool for your garden shed. There is an easier way to get rid of weeds than using a manual weeder like the one we’ve already mentioned in this article. 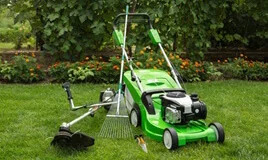 You can always go with a gas or electric weed trimmer and I do have one in my shed as well. I prefer to use it for larger more daunting tasks, but it is a great option if you’re pressed for time as well. The main drawback of using one of these is that it doesn’t get at the root of the weed so it will grow back. I use both a weed trimmer and manual weeder depending on the job and my mood. It may seem obvious, but no garden is going to look to good if you don’t cut the lawn. That’s why every garden shed simply has to have a lawn mower in it. 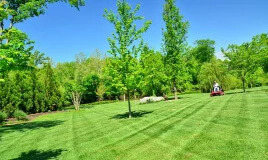 Some prefer gas mowers, some prefer electric lawn mowers, and others still prefer the manual push mowers, but whatever your choice you have to have a mower. If you need to break up the soil a standard garden rake is okay, but a digging fork is better if you want to get real penetration. You can really get some depth with one of these. That’s why it makes our list at number 20. So there you have it. These are the 20 tools no gardener should be without if they want their garden to be the envy of the neighborhood. I’m sure there’s probably a few more that you can think of, but this is a pretty solid foundation to set you on the right track.